I was cleaning up and found this picture. It was taken last Spring. Friends of Jacksonville Animals (FOJA) held a charity dog wash to raise funds for local shelter animals. 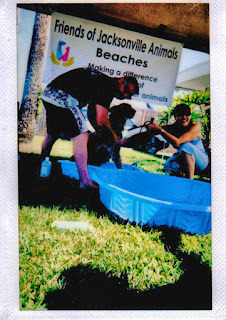 I thought it was a good cause -- and my dogs were a bit stinky -- so I said "Why not?" Son #2 and I loaded the dogs into the Kia and headed to the beach. When the dog washers found Logan's "spot" he started kicking with glee, splashing dirty dog water on everybody within a 4 foot radius. Someone thought it was funny and took this Polaroid. I had no idea it would be the last picture ever taken of him. That was probably the old guy's last road trip too. I'm glad we drove through McDonald's that afternoon and got cheeseburgers for everybody. It was a good day for the dogs. Thankfully, dogs are easy to please. We used to take the dogs for R-I-D-E-S (we have to spell it out) all the time. But as Logan got older it became more and more difficult to get him in and out of the SUV. My little Kia is closer to the ground, but logistically it was difficult to transport everybody. The dogs would fill the entire backseat leaving only enough room for two humans to travel to our destination. And since all my guys are over 6 feet tall, it's an uncomfortable ride for them. Now that we're a one dog family, we take more R-I-D-E-S. Roxy goes with us whenever possible. She's come to expect it. She'll start whining and spinning as soon as Hubby or I touch a set of car keys. We give in. (We're suckers for those big brown eyes.) We're trying to reinforce proper doggie manners when it comes to car rides. She must sit before the door is opened and wait for the OK before hopping in and out of the vehicle. Roxy's got this down pretty good. Hubby, on the other hand, needs further training. 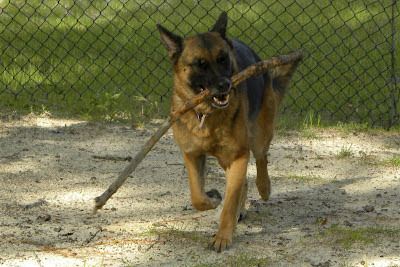 On a recent trip to an undisclosed location where we allow our dogs to run off-leash, (shhh) Roxy found a big stick and was carrying it around. It was so funny that I snapped a picture. I took a few other pictures that day too. When looking at the pictures later I noticed that Roxy is gray around the muzzle. When did that happen?! I did the math and realized that my Puppy Girl is 6 and a half years old. She's middle aged! !